LaunchAsRoot is an app's passport to running as superuser, i.e. with root privileges. It runs as an application and service for launching applications as root user. 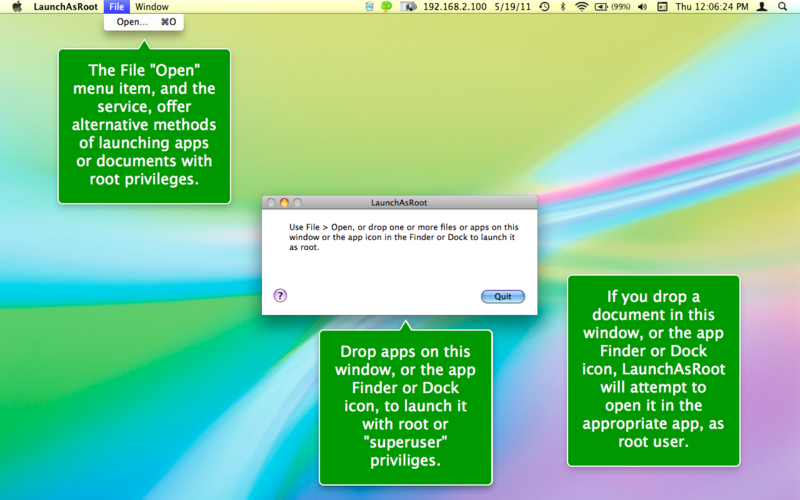 How to use : Drag the application (or a document) you wish to launch as root on top of the LaunchAsRoot application icon in the Finder. You will presented with an authentication dialog. Enter the name and password of an administrator to allow the application to be launched by LaunchAsRoot. LaunchAsRoot quits after launching the application. How to use Service: Control-click on the application (or a document) in the Finder and select "Launch As Root" from the Services contextual submenu.